2007 H&H 36 ft Goose neck trailer with Hydraulic tilt bed. This trailer was originally set up to haul race cars. It has a Storage box and tire rack mounted on the front, along with a winch and lights inside the box. The trailer will easily haul 2 cars or small trucks, even with the box mounted on the front. If you remove the box, you can haul larger trucks, or have more space between the vehicle. The trailer has brand new 10 ply tires mounted on new alloy wheels. We have just installed new bearing and brakes. It has a new Gell battery to power the hydraulic tilt, and we have a new Interstate stored inside for the winch system. 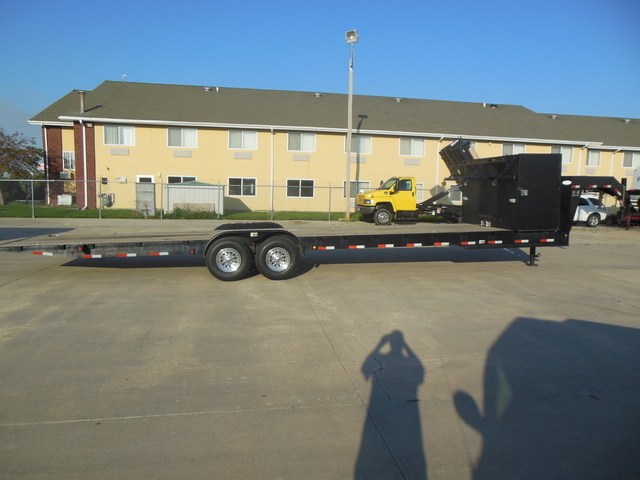 Also included with this trailer is a 10,000 lbs winch. It will pull up even the heaviest of vehicles. The trailer works great to load even the lowest profile cars, and race cars. It has twin 7000 lbs axles so it can handle skid loaders, track hoes, tractors and other heavy units. I have personally used this unit and can tell you first hand that it works as is should. No problems or issues. This trailer has been used by our Automotive business and to haul my Race Cars. I can tell you anything about this trailer. Give me a call on my cell phone at 515-571-4401 or at the shop 515-955-3399 AutoDrive Inc.